Internationally acclaimed Russian-born American cellist Misha Quint will be featured in concert at Carnegie's fabled jewel-box Weill Recital Hall on Thursday, May 11th at 8 p.m., Under the auspices of the InterHarmony® International Music Festival, this season closer in Manhattan will be a varied evening of romantic Latin music themed "Flamenco, Tango, and Jazz." True to InterHamony's mission, this night offers a rich mix of the well-loved and the unusual, performed by globally renowned artists and brilliant young musicians on their way. 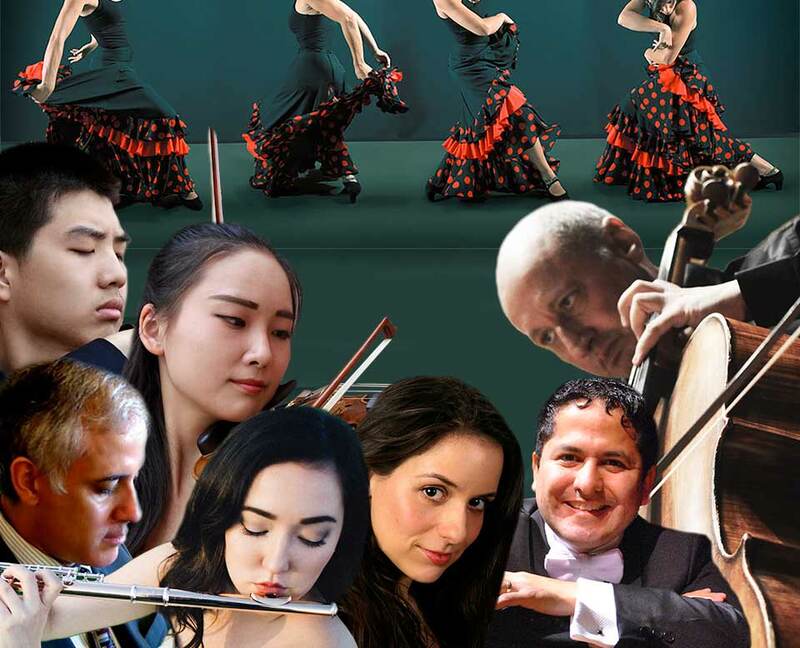 From arias of Bizet's Carmen and instrumental selections of Granados, Piazzolla, Falla, Casals, and Sarasate, there will also be more contemporary music of Ginastera, the Russian Rodion Shchedrin's tribute to Albeniz, and Englishman Michael Mower's witty Flute Sonata Latino. Tickets are $40, and can be purchased by calling CarnegieCharge at 212-247-7800, at the Carnegie Hall box office located at West 57th and Seventh Avenue, or online at www.carnegiehall.org. 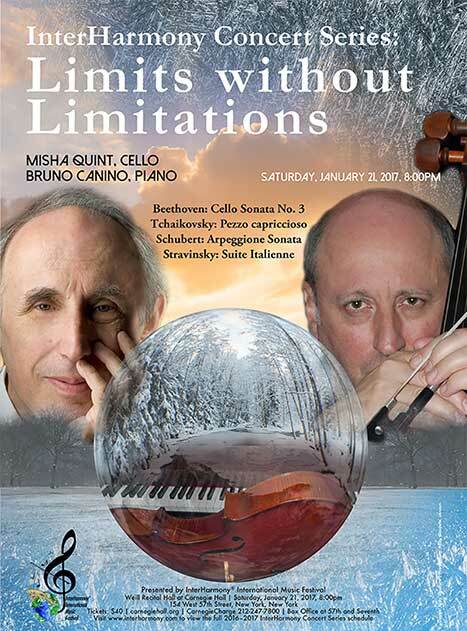 Mr. Quint, neatly described by the late distinguished critic Harris Goldsmith as a "brilliantly accomplished virtuoso - an embodiment of interpretive and executive music-making at its rarefied best," will be joined in solo sets by Argentinian mezzo-soprano, Malena Dayen, lauded by the New York Times' with "Outstanding". Also showcased will be one of South America's most distinguished pianists, Ecuadorian Washington Garcia who has concertized around the world. Supporting the next generation, InterHarmony presents the Carnegie Hall debuts of prize winning flutist Elyse Davis, finishing her DMA at FSU, and the accomplished violinists Sicong Chen and Jingting Liu, classmates at ASU. New York veteran Eduard Laurel will provide the accompaniments. 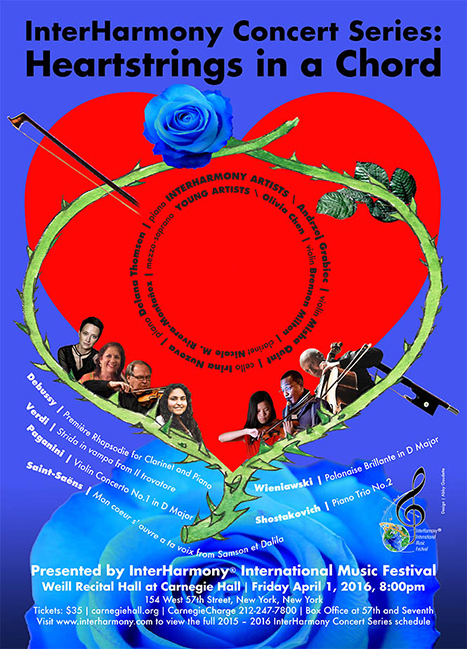 The InterHarmony International Music Festival based in New York City has imprints in Florida, The Netherlands, The Berkshires, and San Francisco, and summer residencies in the picturesque European cities of Sulzbach-Rosenberg, Bavaria, and Acqui Terme, Piedmont, Italy. 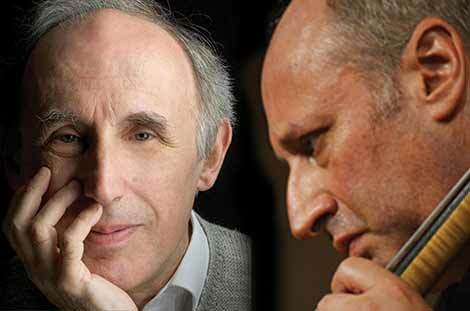 Concerts are presented where wonderful young talents can take flight under the tutelage of music’s greatest artists. Please join us for our Hispanic celebration with an international cast this 11th of May. Olé! Praised by the New York Times as “Outstanding” for her March 2013 performance at Carnegie Hall, mezzo-soprano MALENA DAYEN made her debut as Cherubino at the Teatro Municipal of Rio de Janeiro in November 2015. She has performed the roles of Mercedes (Carmen), Musico (Manon Lescaut), Zweite Magd (Elektra) and Myrtale (Thaïs) at the Teatro Municipal de São Paulo. Malena made her debut as Carmen with the Natchez Opera Festival, and repeated the role at the Festival d’Art Vocal de Montreal, New York Lyric Opera Theatre and the International Institute of Vocal Arts. Born and raised in Buenos Aires, Argentina, Ms. Dayen is a Spanish music and tango specialist, performing this repertoire with the Vancouver Symphony Orchestra, the Rochester Philharmonic Orchestra and in venues such as Weill Hall at Carnegie Hall, and the Queen Sofia Spanish Institute. She sang the title role in Piazzolla’s Maria de Buenos Aires with Opera Naples in Florida and with Opera Hispanica in New York City (outreach). She is the lead singer with New Aires Tango, an ensemble that performs contemporary arrangements of tangos and boleros since 2010. Frequently sought after by composers Ms. Dayen recently was a featured soloist for the New York premiere of The Blizzard Voices (Paul Moravec) and Requiem (Bradley Ellingboe), both at the Stern Auditorium at Carnegie Hall. She created the role of the Nurse in the world premiere of Phaedra ed Hippolytus (Chris Park) at the Palacio das Artes in Belo Horizonte, Brazil. She also premiered Robert Cuckson’s cycle Der Gayst funem Shturem and has performed several concerts of music in Yiddish, with repertoire ranging from works by Viktor Ullmann to songs from the Yiddish theatre. Ms. Dayen has concertized extensively with the Oratorio Society of New York, with whom she has toured Hungary, Italy, and Brazil as she will be their Alto Soloist for their upcoming tour to Uruguay. Other international appearances include concerts with the Teatro Colón Orchestra, the Israeli Chamber Orchestra, and the Orquesta Sinfónica de Puerto Rico. Malena is collaborative artist and the Weill Music Institute at Carnegie Hall, where she participates of the Lullaby project and the Family Days. She is a member of Moving Star, a vocal ensemble based at Carnegie Hall that specializes in improvisation and a voice teacher at the UN International School. Ms. Dayen holds a master and a professional studies diploma from the Mannes College of Music in New York City. Ecuadorian-American pianist WASHINGTONG GARCIA ELJURI began his musical studies at the age of 6. Among his teachers have been Genoveva Granja, Toshko Stoyanov, Ann Schein, Yoheved Kaplinsky, and Julian Martin. Dr. García holds a bachelor of music from the National Conservatory of Music in Ecuador, and master’s and doctoral degrees from the Peabody Institute of the Johns Hopkins University, where he graduated at the age of 25 as the youngest Latin American to have received a doctoral degree in piano performance from that prestigious university. The success of his first public performance at the age of 6 led Dr. Garcia to perform at the most important cultural centers in Ecuador. He was awarded first prizes at the Guillermo Wright-Vallarino National Piano Competition held in Quito, the Elizabeth Davis Memorial Piano Competition and the 19th International Young Artist Piano Competition in Washington D.C., the 2004 Baltimore Music Club Piano Competition, and the Harrison Winter Piano Competition. As the winner of the Harrison Winter at the Peabody Institute, Dr. García was selected to perform with the Peabody Concert Orchestra. He was also a top prizewinner at the Yale Gordon Piano Competition and the Russell Wonderlic Piano Competition. From a very early age, Dr. García became a seasoned veteran of the concert platform, performing extensively throughout his native country. Since his debut with the Ecuadorian National Symphony Orchestra at the age of 15, he has been an active recitalist, soloist, and lecturer in prestigious venues in Italy, Switzerland, Austria, France, Spain, Hungary, Lithuania, Latvia, Canada, Chile, Mexico, Ecuador, Colombia, Japan, China, Indonesia, Singapore, Taiwan, and the United States. In the United States, he has offered solo recitals and master classes in almost 30 states. Dr. García’s international debut took place in Santiago, Chile, where he performed for former President Patricio Aylwin at the Claudio Arrau International Piano Seminar. Subsequently, he was chosen from a large field of contestants from 33 countries by the Kennedy Center for the Performing Arts in Washington D.C. to receive one of two $25,000 grants awarded to pianists in its Fellowships of the Americas Program. As a result, he came to the United States to begin intensive piano studies with Professor Julian Martin at the Peabody Institute. Under the auspices of the Fellowships of the Americas Program he was invited to play at the Kennedy Center Terrace Theater, the Organization of American States, the World Bank, the Inter-American Bank, the Corcoran Gallery of Art, the Department of State and the Mexican Cultural Center in Washington D.C., among others. He was also invited to perform at the National Library and Archives in Ottawa, Canada, where he performed on Glenn Gould’s piano. Dr. Garcia has performed in Ecuador with the National Symphony Orchestra and the Cuenca Symphony Orchestra. Other engagements as guest soloist include concerto performances with the Green Valley Chamber Orchestra in Las Vegas and the Susquehanna Symphony Orchestra in Maryland. He also toured Italy with the Texas State University Chamber Orchestra, performing Beethoven’s Triple Concerto and most recently he was featured as guest soloist with the Austin Symphony Orchestra in Texas and the Springfield Symphony Orchestra in Massachussetts under the batons of maestros Peter Bay and Kevin Rhodes, respectively. 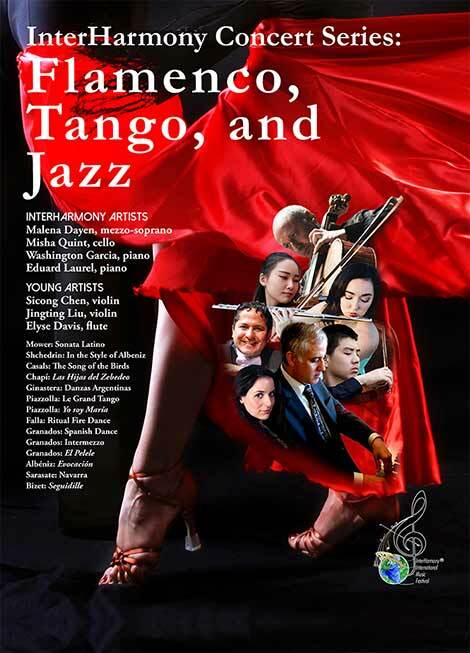 Garcia has performed and recorded for Radio Television Hong Kong, Opus Classical Radio in Mexico City, WFMT in Chicago, TV Spain, Rogers Broadcasting Company in Canada, and worldwide broadcasts through Univision. He has also been featured in several journals and magazines including the Austin and Texas Monthly, Time Out Jakarta, The Hispanic Outlook in Higher Education, The Washington Post, and several others in Asia, North and South America, Europe, and the Middle East. In addition to awards granted by the Peabody Institute and the Ecuadorian government, including the prize “Monseñor Leonidas Proaño” and the award “Al Mérito Laboral,” Dr. García received sponsorship by United Airlines. He was also named a Presser Scholar and grant recipient by the Presser Music Foundation. Additionally, he was awarded the Texas State Quarterly Team Award in recognition of outstanding service and the Friends of Fine Arts Awards for Scholarly/Creative Activities and Service. Dr. Garcia was a recipient of a full scholarship by the Peabody Institute of the Johns Hopkins University in addition to scholarships by The Lloyds Bank, The Zaldumbide Rosales Foundation, and the British Embassy in Ecuador. Dr. García served on the faculty of the Peabody Preparatory of the Johns Hopkins University and is a faculty member at the InterHarmony International Music Festival in Tuscany, Italy and the Peabody Piano Festival in Baltimore, Maryland. He is currently the Director of the School of Music at the University of Nebraska at Omaha where he is also a Professor. Previous to his appointment at UNO, Dr. Garcia was a Professor of Piano at Texas State University, where he was also the Assistant Director of the School of Music. Washington García became a Steinway Artist on 2014 and a citizen of the United States on March 2013. He lives with his wife Valeria and son Mateo in Omaha, Nebraska. Pianist EDUARD LAUREL has been a collaborative partner to countless instrumentalists and vocalists in New York City and worldwide. He has performed and recorded extensively with violinists James Ehnes and Lara. St. John, and with trumpeter Rolf Hedwig. He has performed in every prominent New York concert hall, as well as in London, Belfast, Milan, Montreal, Toronto, Ottawa, Tokyo, Shanghai, Seoul, and Sydney, among many others. He has been a staff accompanist at the Juilliard, Mannes, and Manhattan schools and has lectured on supportive pianism at NYU and Queens College. He has accompanied classes for Galimir, Stern, Perlman, Gingold, Preucil, Rosand, Bashmet, Kashkashian, Yo Yo Ma, Starker, Brey, Kossak, Bylsma and Julius Levine, as well as for members of the Guarneri, Amadeus, Emerson, Juilliard, Borodin, Orion, Tokyo, St. Lawrence and American string quartets. In addition,, he has played for Rampal, Julius Baker, Stoltzman, Krakauer, John Mack , Richard Woodhams, Frank Morelli, Phil Smith, David Jolley, Phil Myers, Per Brevig, and Alan Baer. He is sought after for his “phenomenal articulation” (Gramophone), his “first rate chamber music making” (The New York Times) and his “superb pianism” (The Strad). Flutist ELYSE DAVIS is an active performer and soloist in the Tallahassee area and throughout the United States. She recently won third prize at the National Flute Association’s Orchestral Audition Masterclass Competition in 2016. Originally from Arizona, Ms. Davis’s performances as a chamber musician and with the Arizona Symphony Orchestra have been broadcasted on KUAT, Tucson, Arizona’s classical music station, and she has recorded world premieres with the Flutefinity and HarpFusion ensembles. She has performed as principal flutist of the FSU Wind Orchestra, University Symphony Orchestra, Chamber Winds, UA Wind Ensemble, and Arizona Symphony Orchestra. Ms. Davis is a member of Silver Lining Flutes, a versatile chamber quartet that aims to affect both listeners and performers by pursuing uncompromisingly high musical standards, cultivating an appreciation for chamber music through distinctive performance, and enhancing the cultural life of the Tallahassee community. The quartet recently returned from a week-long tour of performing and teaching throughout Costa Rica, sponsored by the Florida State University College of Music and Costa Rica’s Centro Cultural Costarricense Norteamericano. Ms. Davis won the 2015 Florida MTNA Young Artist Competition, and was a finalist for the Tucson Symphony Orchestra Young Artist Competition and UA President’s Competition in 2011, 2012 and 2013. 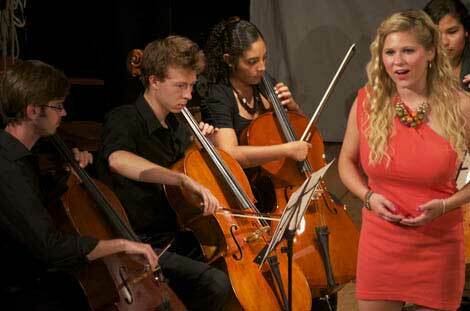 She was also a finalist of the prestigious Carnegie Hall Collegiate Honors Recital Competition in 2013. 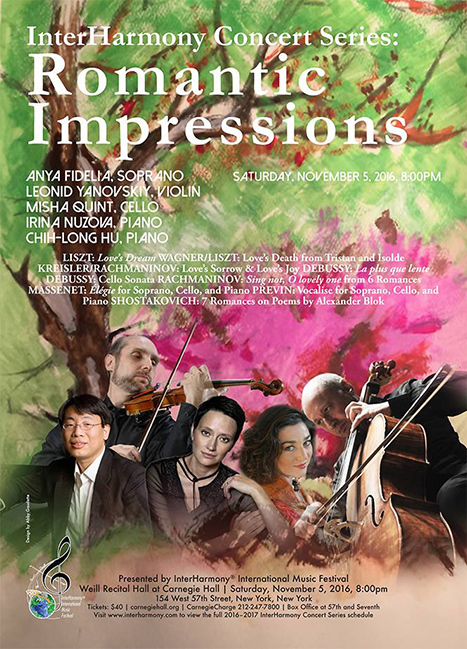 An active promoter of new music, Ms. Davis premiered ADARNA (2015), a flute concerto by Jabez Co, as part of FSU’s Orchestra Project for University Student Composers, or OPUS C. Davis performed internationally as both a soloist and chamber musician in Italy as part of InterHarmony® Music Festival in July of 2015. She was chosen as a performer for the highly selective Imani Winds Chamber Music Festival at The Juilliard School in 2013, which was funded in part by her Medici Scholar award for excellence in musicianship and academics. Ms. Davis is passionate about outreach and organizational involvement and is the past president of the Alpha Beta chapter of Sigma Alpha Iota, the International Women’s Music Fraternity. She has also served as Social Media Coordinator for the Flute Association at FSU, and is currently the Flute Association’s vice-president elect. In 2015 and 2017 she was invited to perform as part of the Raines Ensemble at the National Flute Association Convention, and performed as part of the FSU Flute Choir at the Florida Flute Association Convention. She is an active member of the Flute New Music Consortium, a participant-driven organization formed for the purpose of continuing to expand the flute repertoire. Ms. Davis performed on the FNMC Concert at the 2017 Florida Flute Association Convention, and was a judge for the 2016 FNMC Composition Competition. Her primary instructors include Eva Amsler and Dr. Brian Luce. Ms. Davis is currently pursuing her Doctor of Music degree in flute performance at Florida State University, where she is enjoying her third year as a Teaching Assistant. She earned her M.M. from FSU, and her B.M. in flute performance with academic honors from the University of Arizona. Born in Beijing, China, SICONG CHEN began studying the violin at age five with renowned Chinese violin pedagogue Xiongda Jiang. He has won many awards including the Golden Prize in 2012 Sicong Ma National Violin Competition, Second Place in 2013 and 2014 Hong Kong International Violin Competition, and Second Place in 2014 Schoenfeld International String Competition. He has performed in prestigious concert halls in China such as the Beijing Concert Hall, Millennium Monument Concert Hall, Zhong Shan Concert Hall, and China National Library Concert Hall. He was the concertmaster for the Beijing Youth Chamber Ensemble, a group that won First Prize in the Hong Kong International Chamber Music Competition, and Second Prize in the China Hummingbird Chamber Music Competition in 2015. Currently a sophomore, Sicong is pursuing an undergraduate degree in violin performance at Arizona State University under the direction of professor Danwen Jiang. He has studied chamber music with the Brentano and Ying Quartets through ASU’s Visiting Quartet Residency Program. In 2016, he participated as young artist in the InterHarmony Music Festival in Italy, where he and his violin Duo received the honor to perform for the master class of Vadim Repin; later, the Duo was invited to present a performance at the Weill Recital Hall at Carnegie Hall in New York City. Born in Anhui, China in 1996, JINGTING LIU began studying the violin at the age of 5 with Jiaming Sun, Associate Professor at Anhui Artistic Vocational College. She was a winner of her age group in Anhui Provincial Violin Competition every year from 2006 through 2012. In 2013, she was accepted into the violin class of renowned Chinese violin teacher Xiongda Jiang, with whom she continued her violin study in Beijing. In 2014, she won First Prize in Hong Kong International String Competition (Youth Division). Currently, Jingting is a Junior, pursuing a Bachelor of Music degree in violin performance under the guidance of Danwen Jiang at Arizona State University. Since arriving in the United States, Jingting has won the Vivaldi Concerto Competition in Arizona, which lead to a performance of Vivaldi’s “Spring” Concerto with the Four Seasons Orchestra; the performance was broadcast by AZ-KBAQ radio station. She was the winner for the String Area at ASU’s Concert of Soloists Concerto Competition in 2015. She has performed for the violin master classes of Cho-Liang Lin, Vadim Repin, Rachel Barton Pine, Peter Zazofsky, and Henry Gronnier, and studied chamber music with members of the Shanghai, Brentano, and Ying Quartets. In spring of 2017, her violin Duo (with fellow ASU violinist Sicong Chen) was invited by the InterHarmony International Music Festival to perform at the Weill Recital Hall at Carnegie Hall.